Despite the known dangers of sun exposure, I refused for many years to use self-tanning products: they were messy, stinky and almost always looked obvious. This includes the big brand-name products whom I won’t name and shame here. At one stage, I would only associate myself with self-tan if I had it done at a professional salon, applied by a professional beautician, for a (VERY) special event. Even then, sprinting out of the salon (post-spray), hoping nobody will catch you in your tracksuit looking like you’ve just lost a mud fight, is not my idea of a relaxing spa treatment. Not to mention the drying time, the no-showering time and the general disruption of your day. All of this changed when I stumbled across the St Tropez Gradual Tan Everyday Body Moisturizer Medium/Dark during time spent in the USA. This product works like a moisturizer, which you simply apply before bedtime, as you would any old moisturizer. It takes about three minutes to dry and won’t stain your sheets. Best of all, you’ll wake up looking ever-so-gently sun-kissed, with no streaky bits and no bad smell (it does have a slight scent, but not one that’s offensive). Awards Winner of Elle Beauty Awards, Company Beauty Awards and InStyle Best Beauty Buys. Who is it for? Anyone who wants to slowly build up a golden tan. Note: this product is not for anyone who wants to resemble Miss Hawaiian Tropics or Ross in that Friends episode. Application Exfoliate well before massaging this luxurious lotion in from top to toe. Don’t worry if you go over the same area twice, it’s only missed areas that’ll look uneven. Wait for the lotion to be absorbed before getting dressed and remember to wash the palms of your hands and in between your fingers after use. Use daily for a subtle golden boost to winter or sun-tanned skin. Don’t apply to broken, irritated or sensitive skin. 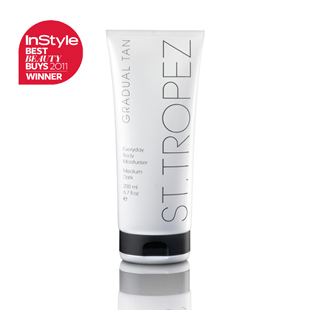 SA Most large Clicks outlets stock the St Tropez range. International You will find this product at all leading department store beauty departments and certain spas across the globe. If you want to have it delivered to your door, visit www.st-tropez.com to place your order. I have to agree, this product range is amazing. The Clicks store in the V&A Waterfront, Cape Town, stock the entire range.